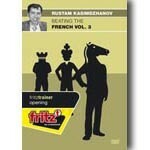 In the third DVD from his series Beating the French Rustam Kasimdzhanov presents a promising White repertoire based upon 3.Nc3. Topic of this DVD is the after 1.e4 e6 2.d4 d5 3.Nc3 dxe4 4.Nxe4. White has a space advantage in the center, (pawn d4 versus e6), yet Black strives for equality by piece exchanges and the break c7-c5. 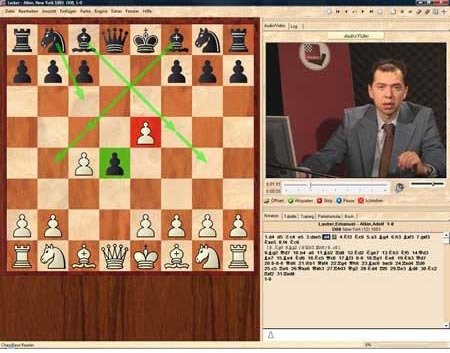 Explaining top grandmaster games, Kasimdzhanov shows how White can fight for the advantage. In 11 video lessons he reveals the most important strategies and plans, analyzing both sharp attacking performances and patiently won endgames. This way, studying Kasimdzhanovs commentaries will not only help you to master to a particular opening variation, but also vastly improve your chess understanding in general. Video running time: more than 3 hours. Rustam Kasimdzhanov. Born in 1979, the grandmaster from Uzbekistan has for many years been known as a very strong and imaginative player. However in 2004 Rustam Kasimdzhanov (pronounced Kah-zeem-jha-nov) shocked the chess world by winning the FIDE world chess championship title, beating a string of world-class players like Ivanchuk, Grischuk, Topalov and Adams in the process. Kasimdzhanov is a very deep player, who is able to explain chess ideas in an eloquent, lucid style, with a fine touch of humor. His lessons are both entertaining and instructive perfect for students who seek to avoid dry theory.